One of the most prominent features of life in Groningen is the bicycle. 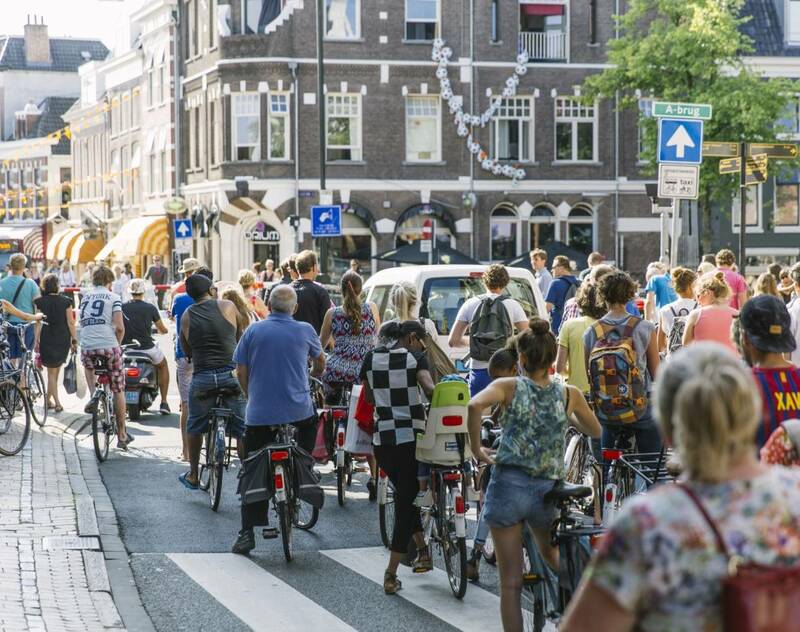 There are even more bicycles than people - by most recent calculations, there are 1.3 bicycles per person across the Netherlands, meaning almost 300 000 in Groningen alone! But how did the bike come to have such a prominent place in Dutch life, and especially in Groningen? Here we give you a brief history of the bicycle in Groningen, including its impact on urban planning and the current developments in the city. The first bicycle arrived in Groningen in 1869, exactly 150 years ago. Initially cycling was a hobby pursuit for the elite, especially well-to-do young men. Bikes were expensive, hard to ride, very impractical, and not considered a means of transport. But by the end of the 19th century the design had become safer and more practical - and the new ‘Safety’ bicycle, as it was called, still forms the basis for bicycle design today! (We say: why mess with a winning formula?) As a result, more and more people started to use the bike, including the middle class and small business owners. The new bicycle form was much easier to ride with a skirt on, so women started to cycle too. From 1900, the bicycle took off. Local bicycles were produced by Fongers, located in the city, Gruno (Winschoten, east Groningen) and Veeno (Bedum, just north of the city). Bicycles steadily became cheaper. More and more the bicycle was used to get around, not just for leisure activity, and the first transport bicycles started to appear. Groningen as a cycling city was born. From after the second world war, a competitor reared its head: the car. As cars became more common and started to take up more urban space, they presented a challenge to city planners. Market squares were transformed into parking lots - unthinkable now - and plans were made to flatten old neighbourhoods to make space for wider arterial roads to cross the city centre. It looked as if the car was winning. But then, a progressive local government, and in particular, a 24 year old politician named Max van den Berg, entered the scene. Van den Berg decided to reverse the trend and proposed a radical traffic policy: expel cars from the centre and make more space for bicycles and pedestrians. His plan divided the centre up into four quarters, and made it impossible for cars to get from one quarter to another. So it became impossible for cars to cross directly through the centre. In contrast, more space and more freedom was given to bikes and pedestrians. This ‘traffic circulation plan’ as it has come to be known, was instituted in 1977. Since then it has become legendary in urban planning, and it still shapes Groningen’s cycling policy today. The bicycle continues to dominate the landscape in Groningen. The current urban policy respects this fact, and updates the van den Berg’s policy for a growing city. New is the mixed use policy, where bikes and pedestrians are given equal right of way on the street - for instance on the Brugstraat. This is part of the municipality’s pioneering approach to public space. Also in the pipeline is a cycling tunnel under the main train station. You can read about these developments and more in the recent Cycling Strategy document of the municipality. Healthy, compact, environmentally friendly, and super democratic - all these characteristics make the bicycle fit Groningen perfectly. And make it the perfect means of transport. All that remains to say is: Long live Groningen, cycling city! And here’s to another 150 years of bicycles in Groningen!